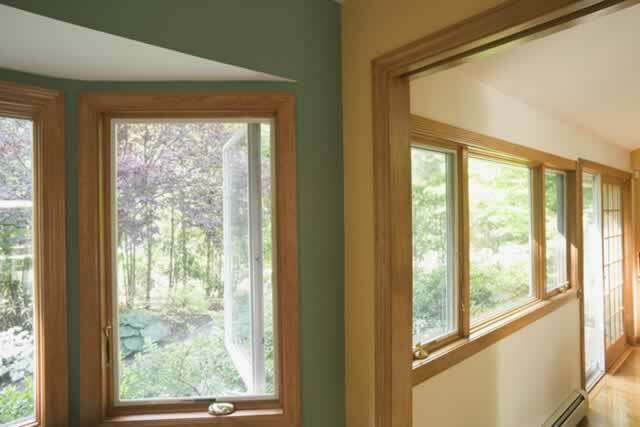 You know you're looking at clad windows windows typically refer to a window that appears to have a wood interior but is displays another stronger, lower-maintenance material on the home's exterior portion. Clad windows can also be simply a wooden frame covered with a special coating (or "cladding") on the inside and outside face, although typically on the outside only. Materials used to clad a window include aluminum, vinyl, and fiberglass. The idea is to enjoy a simple-to-maintain window that offers the sturdiness of vinyl plus the beauty and warm look of real wood from the inside. Clad windows provide protection from bad weather, strong sunlight, and other natural elements. In recent years, clad windows have become highly desirable and included on the list of "must haves" for custom homebuilders in particular.